Pushpa Yagam to Save the Mother Earth from Earth Quake! The annual ‘Pushpa Yagam' festival was held on Thursday at the famous hill temple of Lord Venkateswara amid religious fervour. Over seven tonnes of a wide variety of bright and aromatic flowers were used in the festival. Earlier in the morning ‘Snapana Thirumanjanam' was performed to the ‘utsava' deities of Lord Malayappa and his two divine consorts inside the main temple complex. Immense importance is attached to the festival, which according to scriptures is observed to pray to the Lord to save the earth from natural calamities such as earthquakes, cyclones and epidemics. Earth quakes, cyclones and other natural calamities however continue to wreak havoc with human life in various parts of the world. According to Wikipedia not less than 40 major earth quakes involving hundreds or thousands of fatalities are reported in the current century. In India, more than 20000 people died in the earth quake that visited Gujarat in 2001.In the 2004 Indian Ocean Earth Quake, over 2 lakh people were perished, out of which more than 18000 were in India alone. In the recent earth quake that rocked Sikkim on September 11, 2011, 111 people were killed. No amount of pushpa yagams came to the rescue of the people or the land. If we have succeeded in controlling epidemics, it was not because of any expensive pujas offered to any deities. It is not that the wealthy devotees whose well or ill earned contributions fill the coffers of the temple are completely unaware of the real cause of earth quakes, cyclones and epidemics. They are aware. The temple however continue to perform them as as ritual handed down to them from the hoary past. 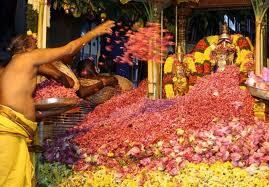 And the devotees do not question them as they hesitate to challenge a tradition. It could also be because the devotees still harbor a fatalistic attitude towards unpleasant things in our life - such as natural calamities. But that does not mean that they should continue to do it. A number of practices which were earlier considered divine and hence unalterable have been done away with because of progressive movements among the devotees themselves or as a result of legislative measures. The revolting animal sacrifices performed in many a temple has thus been banned in a number of states (though the practice continues in certain places clandestinely) as a result of both the people' agitation as well as the subsequent government orders banning them. But, how can we compare floral offering with animal sacrifice? You may protest. It surely is a legitimate question. A pushpa yagam is definitely not as revolting a ritual as animal sacrifice. However, apart from the fact that both tend to instill and perpetuate fatalism among the people, it is also massive waste of resources. This can be compared to the recent attempt (in September 2011) by some people in Bangalore and Mysore to enact a 'tomato fight' mimicking the Spanish festival La Tomatina. It was legitimately criticized and the State Government banned the event saying that tomatoes should not be wasted. Similar argument can be advanced against pushpa yagam too. An alternate and more ethical event could be a Flower Show open to the public. While one tries to understand the psychological need of the people visiting religious places seeking mental solace, the massive amount of money spent on worthless offerings to deities is unacceptable. Despite the Tirupati town being the richest pilgrimage city of any religious faith in the world (Uma Sudhir -13 September 2007 – “Tirupati Oust Vatican, Reigns at Top, www.NDTV.com Retrieved 6 November 2011), in terms of Human Development, the state of Andhra Pradesh where the Tirupati temple is situated ranks (with a score of 0.416) at a low 10th in comparison with all other Indian States (Human Development Report 2007). Why cant the temple authorities spend the money to improve the living standard of the people of the state, instead of wasting it on worthless pujas?